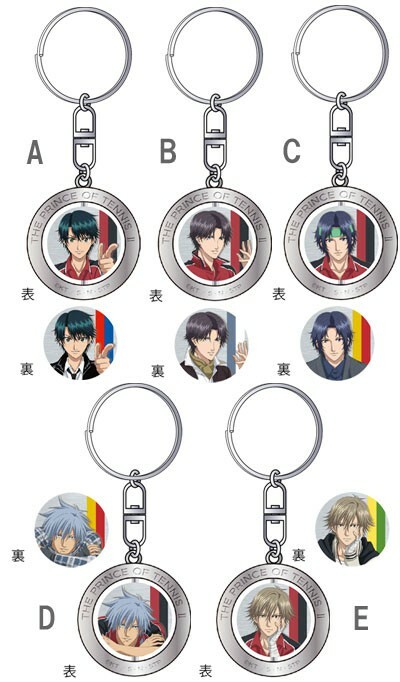 Does anyone want a rotating Keyholders of the Tenipuri boys?! They are 9cm in length, made of metal zinc alloy~ The keyholder rotates front to back, each side has the boys in different clothes. One side is their Japan U-17 uniform, and the other has the boys in their semi formal outing clothes, new artwork ^_____^ If I order, they will be shipped with the Birthday Charms (can be reserved here: http://duckie405.livejournal.com/48676.html) and the Shinpuri Music Colorful Collection (can be reserved here: http://duckie405.livejournal.com/42407.html) in September, which means they will be available in October. Each will be $15. They are sold individually so I can buy each character for as many people as reserved. Please leave a comment if you are interested!! ITEMS HAVE BEEN ORDERED! PLEASE FEEL FREE TO LEAVE A COMMENT IF YOU WANT ANY, IF THEY ARE STILL AVAILABLE, I WILL BE HAPPY TO BUY MORE FOR YOU. I have the Rotating Keyholder. Anything else you want or should I give you the total? No not yet, like I said in the post, most likely they won't be here until October. Ummm, I think it's better if I pack and send you the three items that's I currently have, and then went he other figures come, I can ship those later. Otherwise, it's more than a month away, I prefer to get my money back as soon as possible. They're so cute! Please put me down for Niou! Okie dokie, one Niou it is! !